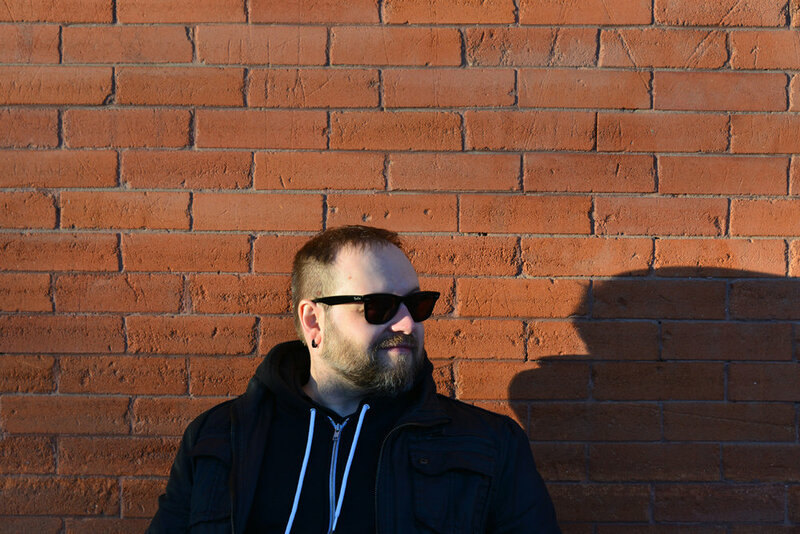 If you want to learn about the music scene in Saskatoon, Craig’s your man. He even wrote a book about it. However, his engagement in arts and culture extends beyond Saskatchewan. I recently enjoyed reading an interview on his pop-culture website The Feedback Society with Laura Jane Grace from Against Me! where they discuss the band’s latest album Transgender Dysphoria Blues, and the life experience that inspired it. Because of my day job as a Creative Director, I’m learning a lot about Digital right now. I spent the last few years digging into design, reading everything I could and meeting all the local designers that I think are great. Of course, away from work, I’m always still working. I write for a variety of magazines and websites, and appear on TV and the radio, mostly talking about film, music, and dining. The arts, I suppose. I’m always working on our pop culture website, The Feedback Society.com. Myself and a variety of talented writers work on reviews or essays about any aspect of pop culture we want. The site is a learning ground for amateurs, but it’s also a place that professional writers can write about things their editors don’t always greenlight. We have writers that have worked in places like The National Post, The Calgary Herald, MSN, NPR, PopMatters, and more, so there’s some real talent on the site. Right now I’m in a state of flux, trying to decide what my next big writing project should be. Oddly enough, since moving to Nutana, and being moved by its history, I’ve had a crazy idea about a comedic time travel novel or story that is very regionally focused. I don’t know who’d want to read it though. Maybe I need to get past the weird internal need to have my work read by a lot of people and do it for myself. My day job is Creative Director at Rawlco Radio, Rawlco Transit and Taxi, and Rawlco Digital. So I manage a team of writers, audio producers, and graphic and web designers. I work with a ton of local businesses in Saskatoon to help craft their ad strategies and stories. I am also on air as a film and pop culture critic. What I like about it is that it is challenging. It’s allowed me to grow from being a wannabe writer with an English degree into being an actual writer, and then a Creative Director. It’s a company that allows you to explore your limits. I had worked in film and studied art, but I had no real background in design. Because they trusted my work and dedication, they gave me the opportunity to immerse myself in that world so I could come out the other side with a strong enough grasp of design to manage a team. A lot of companies would have just hired an art director. They push me to be better, and in turn, I push my staff to be better. It’s always a challenge to be able to insert art or good writing into an advertisement, but being able to do that is what makes a good ad stand out. People look down on advertising, but it always pushes the art world forward and many of the best writers and comedians started by copywriting in the ad world. It allows me to do my separate creative things, while putting food on the table for my family, while also working in a highly creative environment every day, with brilliant people. In terms of my freelancing, I’d sort of call that a day job. Except that it happens on evenings and weekends. I used to work 80 hours a week between radio, freelance writing, and the film company I sometimes consult for. So that was pretty challenging. But it’s been fun, for the last 15 years or so, to do so much writing. I get to meet a lot of interesting people and tell their stories. The real challenge was learning to schedule and prioritize. And of course, I’m always trying to be a better writer, which is a lifelong pursuit. First and foremost, my wife and two-year-old son. Also my extended family and my inner circle of friends are extremely important to me. It’s important to me to have record parties with my friends where we drink beer and argue about films, music, and books. As I get older and grow a family, while I may pull back on freelancing, it is of the upmost importance to me that I am not leaving behind creative outlets. I need to write. I need to read. I need to design. I need to always be learning. I need to be steeped in film and music. I need to record music. I need to travel and see the world. Lastly, it’s important to teach my son these things, and also teach him to respect others of all genders, sexual orientations, cultures, races, and belief systems. As I said in my book about the Saskatoon music scene, when I was young, I was embarrassed to be from a place like Saskatoon. To paraphrase, “if there’s a bright centre to the universe, we’re on the planet that is furthest from it.” But as I got older, and wrote about the city and its various scenes, I came to realize that I wouldn’t want to live anywhere else. I love this city. I love its people. I love how beautiful it is. What I like least about it is the goddamn winter. I curse my ancestors for settling here instead of somewhere warmer. I also wish that we had a bit more tolerance about certain social issues, but I think it’s easy to paint us with a hillbilly brush, when you can find racism and homophobia everywhere, even in the most cosmopolitan of cities. I actually spent a few years living in Regina when I was a kid, so when I moved here and people from Saskatoon trashed talked the city, I didn’t quite understand. I feel like Regina is coming into its own a bit in the last five to ten years, artistically speaking. I have a lot of good friends that live there, so it’s always fun to visit. With gritted teeth, clutching a bottle of bourbon. Seriously though, I am a lazy, pasty, basement dwelling weirdo. I am an indoor kid. So to me, +30 and -30 are both degrees of uncomfortable. My wife makes me go outside sometimes, to take my son to the park or things like that. But doing so much writing, reading, and watching movies, I don’t tend to venture outside much more in the summer than I would in the winter. So take that, Old Man Winter, you big jerk. KC: (from the Proust Questionaire) What is the trait you most deplore in yourself? I think it would have to be my overwhelming sense of cynicism. I am a cynical Gen Xer, ruined by a University Sociology minor and books/movies like Fight Club. Now, don’t get me wrong — this aids me greatly in almost everything I do. I wouldn’t be the same person, with the same critical abilities without it. And I wish everyone else was more skeptical and aware of their world. But I’m sure it crosses the line from cynicism into being judgmental, and that’s when I deplore it. Being a professional critic, it’s hard to turn that off sometimes. Sometimes, I’d rather be ignorantly blissful.